It’s night, the stars are emerging, and darkness is creeping in. Deeds of the day are done and you’re settling into a nice evening. You turn on the radio and tune in to the evening’s entertainment. For 17 years, Clyde has performed this ritual; first in his hometown of Salt Lake City, Utah, and now high above Portland, illuminating the dark- ness with the power of an FM transmitter, shock- ing us, scaring us, entertaining us, and most of all informing us of what you would never hear on NPR. Ground Zero is Clyde’s nightly descent into the darkness. Parapolitical radio is an interesting phenomenon born out of a respect for the anomalous and a quest for truth, no matter how strange it might look. Parapolitical radio shows like Ground Zero serve a much needed societal role by allowing topics seemingly forbidden by mainstream media to be addressed, from conspiracies to demonic possession and cultural commentary that eventually finds it way around the water cooler. Its controversial nature requires that we, the listeners, have a guide, an everyman to give us permission to jump down the rabbit hole. Our first guide was Long John Nebel. Back in the 1950’s, under the watchful eye of an autocratic state gripped by cold war fears, Long John Nebel and his New York show Party Line openly discussed topics such as UFOs. In fact, one of his pinnacle shows was an interview with Former Marine Air Corps Major Donald Keyhoe who’d walked out of an NBC television show because NBC executives sought to censor him and present a US Air Force-scrubbed version of UFO’s in then-Project Blue Book style. Years after Party Line, Art Bell’s Coast to Coast AM kept the night fires burning. Mysterious Art Bell wouldn’t discuss his background and insisted on broadcasting from a tiny double wide trailer deep in the wastes of Nye County, Nevada, in what he called the Kingdom of Nye. Luminaries such as Father Malachi Martin showed up on his show and made us understand that evil was real and out there, no doubt leading to many a sleepless night among late-night fans. Hale-Bopp put Coast to Coast on the map and accelerated its popularity. I remember listening that 1996 night, driving on a dark and lonely road outside Fairfield, California, illuminated by the lights of distant Travis AFB as Dr. Doom a/k/a Major Ed “Remote Viewing” Dames arrived on the scene to give us his latest analysis of the Hale-Bopp comet and its shadow “Saturn-Like Object.” As the atmospheric tone of Coast to Coast kicked in, it was like driving through the Twilight Zone with Art Bell playing Charon over the River Styx. When Art Bell finally left the airwaves, that atmospheric, moody style of programming went with him—until Ground Zero. A radio host named Clyde Lewis contacted me for an interview after I founded a website called the S4 Database. After our interview, I was hooked— which is not all that uncommon, given that many of Clyde’s interviewees, over the years, have be- come regular listeners of his show, and fueled the show’s growth, Ground Zero being fundamentally everything that was captivating about the original Coast to Coast AM. This has been no small feat, given the advent of podcasts and internet-only broadcasts, the internet now standing in for the Gutenberg press with its prolif- eration of low-cost paranormal radio. Nothing beats real radio, and Ground Zero is just that. So where did Ground Zero come from and who is Clyde Lewis? Most of all, why is he a denizen of darkness, an interesting story in and of itself? Lewis’s earliest investigations into the paranormal began while he was a radio engineer at a small Utah station. One of the hosts on the air there was Wolfgang Gossett, who would later claim fame as a strong suspect in the 1971 D.B. Cooper skyjacker case. Gossett had a paranormal show and invited Clyde to join him on some ghost hunts and other investigations into the paranormal. At one point, Gossett even told Clyde about several premonitions he’d had about an upcoming trip Clyde was planning to take premonitions that turned out to be right. 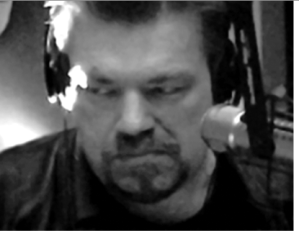 Clyde continued with radio until he got his own show: Kult Radio, which in 1995 he renamed Ground Zero. People ask if he renamed it because of 9/11, but he emphati-cally denies it, and time is on his side. The show was a quick hit. Clyde developed a very different format from other shows in that beyond his training and pedigree as a seasoned radio host, he is also an active researcher. He pioneered the Anti-Christ culminating in the AC/DC god with Prince William of England as the Anti-Christ—a presentation he has given at ConspiracyCon Esozone, and other “fringe” venues. So why call Clyde Lewis a denizen of darkness? The answer is simple: nothing is off limits for Ground Zero contemplation. Like Charon on the River Styx, Clyde is our tour guide to the supernatural, the preternatural, and in some cases the profane. He gives permission to consider the improbable and impossible, like the Moon landing never happening. Prior to the proposed May 2011 end of the world prophecy delivered by Harold Camping, Clyde interviewed Gunter Harringa, #2 at Family Radio, and spent an amazing three hours exploring Camping’s statements and giving listeners a glimpse into the Christian radio network’s beliefs. Later, Clyde interviewed a Vatican-trained exorcist who talked about how people’s bodies change during exorcisms and how in one case a woman turned into a snake. It’s conversations like these that make Ground Zero a mind- stretch. Regardless of the topic— be it politics or geoengineering, mind control or UFOs—Clyde the researcher plummets con- versations into to the heart of the topic at hand, and encour- ages listeners to expand their consciousness. Olav Phillips is founder of the Anomalies Network, the largest UFO and paranormal information source on the Internet. With 24 years of experience in UFO research and study, Olav’s self-proclaimed passion is serving as archivist for the UFO and paranormal community. With a database of 142,000 recorded sightings, his area of specialization is the application of the latest technology to the field of ufology. Phillips uses technology to derive new sets of information, compile and analyze data in new ways, and develop new theories.